It may be any variation in kurma! it becomes my favorite comfort sidedish particularly for chappathi. 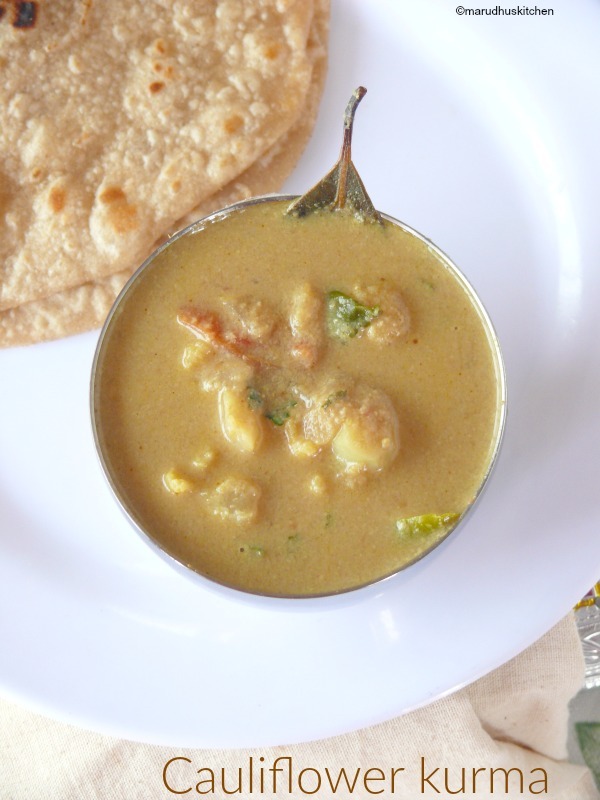 This south indian cauliflower kurma is a special hotel style variation which tastes delicious.This is a coconut based gravy adding more richness with the addition of cashews and coconut milk. You can skip adding coconut milk even then it will taste very delicious. Always washing process for cauliflower is very crucial. Don’t skip to give a rapid boil assuring that they are free from any worms. I love to separate the florets with hands rather than chopping it. Adding spices to minimal makes this south indian cauliflower kurma more enjoyable.Even for poori it will taste great other than chappathi. You can replace cauliflower with other vegetables like carrot,beans,potatoes in whatever combination you want it to be . 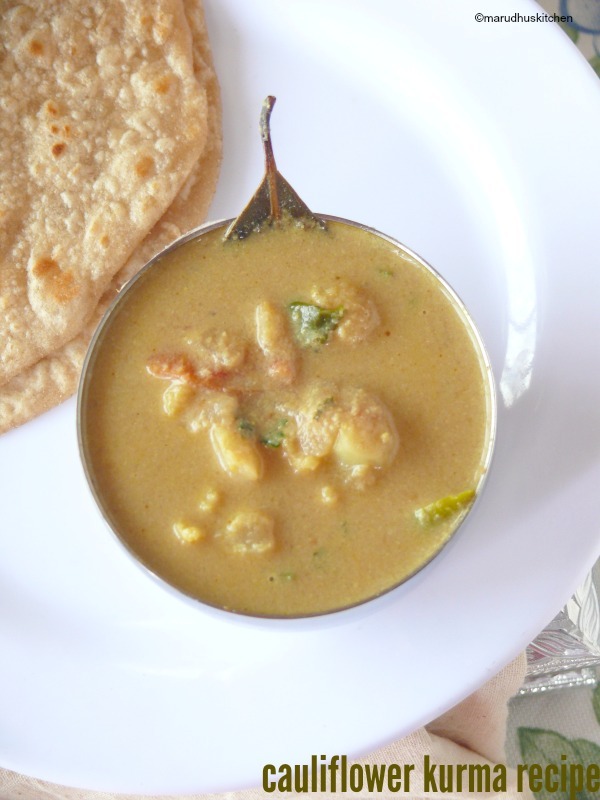 Try this south indian cauliflower kurma you will definitely enjoy it for sure. 1.Remove the florets of cauliflower with hands then boil some water with turmeric. 2.Put these to boil for a second and remove the florets from water and keep ready. 3.Keep every thing ready,even with the grinding part,taking coconut milk. 4.Keep a kadai with oil add cinnamon,cloves and bayleaves. 5.Then add onions and green chillies. 6.Add ginger garlic paste saute till rawness goes off. 7.Then add tomatoes to become soft. 8.Add the florets with turmeric,chilli powder,garam masala and salt needed for the gravy. 9.Saute till masala smell goes off. 10.Add some water and close with a lid so that cauliflower cooks well. 11.When the veggie is cooked add ground coconut paste and let it cook till rawness of coconut combination goes off. 12.You adjust the water for the gravy consistency. 13.Lastly add coconut milk,switch off and add chopped coriander leaves. Remove the florets of cauliflower with hands then boil some water with turmeric. Put these to a boil for a second and remove the florets from water and keep ready. Keep every thing ready,even with the grinding part,taking coconut milk. Keep a kadai with oil add cinnamon,cloves and bayleaves. Then add onions and green chillies. Add ginger garlic paste saute till rawness goes off. Then add tomatoes to become soft. Add the florets with turmeric,chilli powder,garam masala and salt needed for the gravy. Saute till masala smell goes off. Add some water and close with a lid so that cauliflower cook well. When the veggie is cooked add ground coconut paste and let it cook till rawness of coconut combination goes off. You adjust the water for the gravy consistency. Lastly add coconut milk,switch off and add chopped coriander leaves. Adding coconut milk is purely optional. You will get a great tasting gravy without coconut milk too. Balance the spices accordingly to your need. Cleaning process for cauliflower is mandatory.